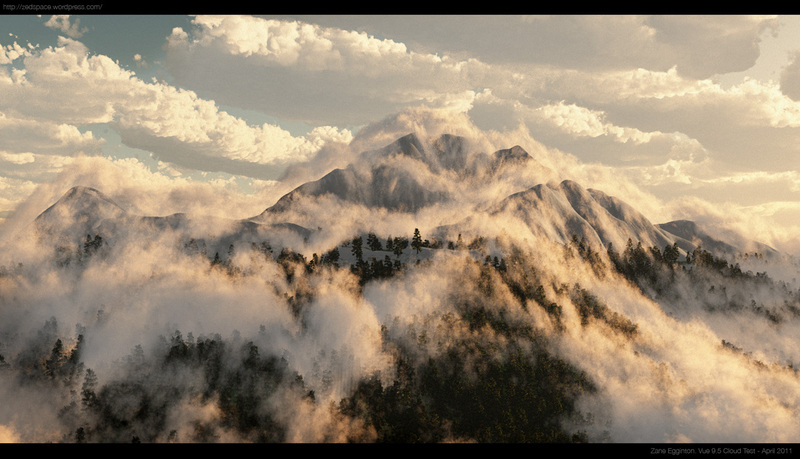 I got my hands on a pre-release version of Vue 9.5 and it’s got some cool new features, including: Advanced Cloud Control, Interactive Texture Placement, Localized Cloud Layers, Fast Hybrid Depth of Field, and even a Velocity Pass (great for post processed motion blur). After playing with it a bit these features are without a doubt awesome however it’s not as easy as it should be. Now I realise it’s early days but getting clouds to roll over hills (like in the demo video) isn’t a simple click of a check box, infact it’s damn tricky and very confusing. You’ll have to look at the tutorial in the reference manual to get it to work but once you do it’s frigin spectacular! The image below was a quick test and as you can see, the clouds are looking damn fine. Being able to limit the cloud zone is convenient and very intuitive but the new “Interactive Texture Placement” tool is a little hit and miss (but it has potential). The fast DoF lives up to it’s name, it is fast and the result is much better than doing it in post, so I imagine I’ll be using it a lot in the future. Overall the advancements in this version are incremental and not exactly revolutionary, but I wouldn’t expect it to be in a .5 release. Nice effect using Advanced Cloud Control. Somehow I can’t get my skies to roll across the mountain. And I really followed the tutorial in the manual. Did you encounter anything wrong with that tutorial ? Can you post a video of the moving clouds? Would love to see it. Great idea. Might give it a crack next week.